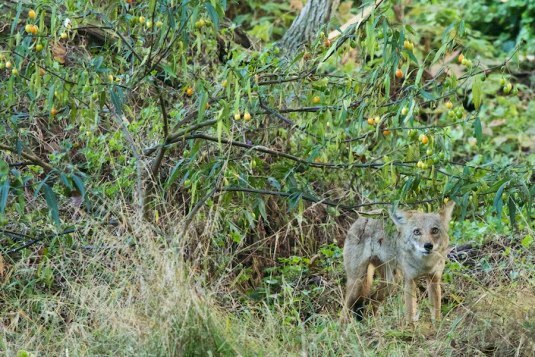 In these times of so much bad news, we republish here a delightful post from the CoyoteYipps blog of wildlife photographer and coyote advocate Janet Kessler (with permission). I watched a coyote forage in one of these bushes. 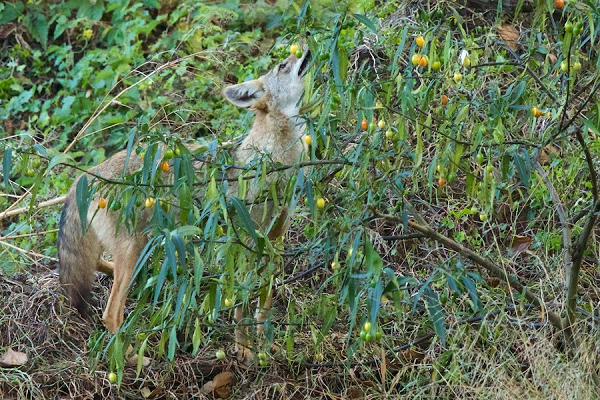 When the coyote left, we went up to examine the berries which I had never seen before. I took a tiny taste, and my friend gulped down a couple to help us determine what they were: the flavor was bitter with a tad of sweet. When I got home, I couldn’t find the plant on the internet, so I turned to my Nextdoor site and posed the question there. 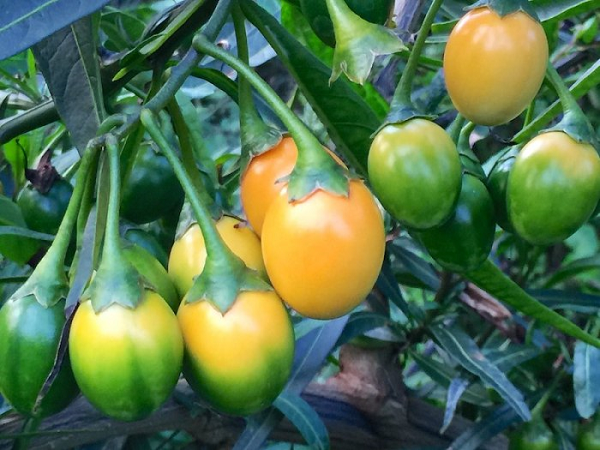 They indeed came up with what it was: Kangaroo apple, as it’s called in Australia, or poroporo, as it is called in New Zealand are native to those areas, but have been naturalized into the Bay Area and can be found throughout San Francisco. 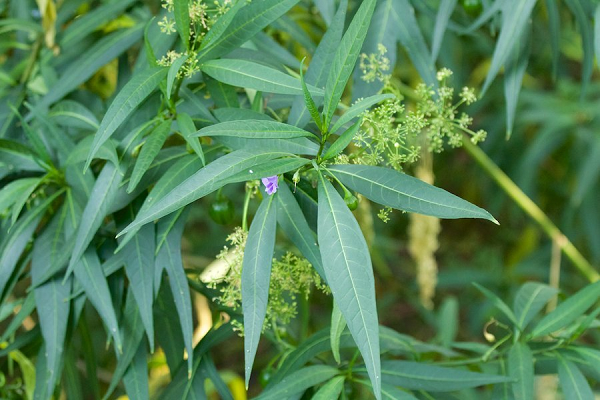 AND, we should not have eaten them as they are poisonous — they belong to the nightshade family! Yikes! One argument we often hear is that “native plants” are better as habitat. It’s very seldom true. Most animals, birds, and insects adapt to available resources – and that includes, often, non-native plants. 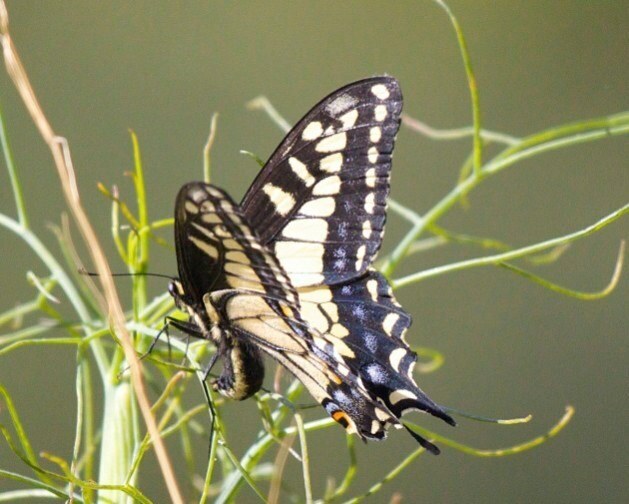 The example above is one; another is the dramatic anise swallowtail butterfly that depends on non-native fennel. 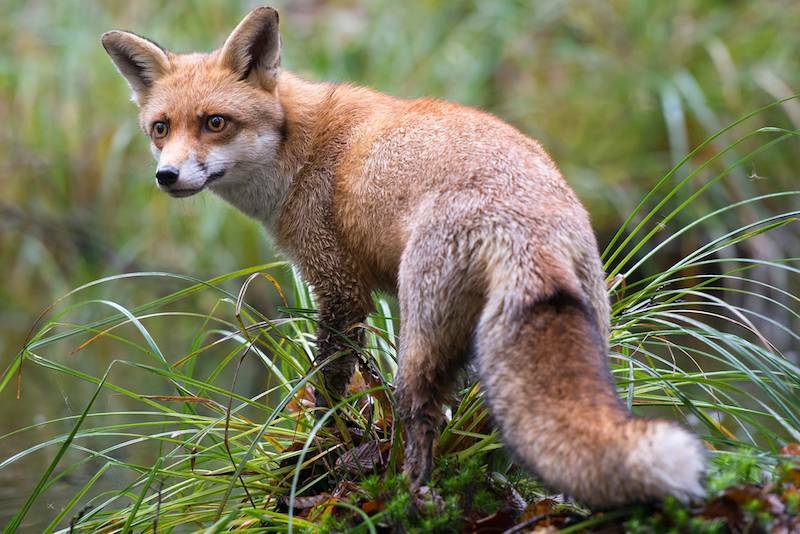 San Francisco Forest Alliance stands for Inclusive Environmentalism, opposing xenophobia and welcoming the species that will save our changing world. 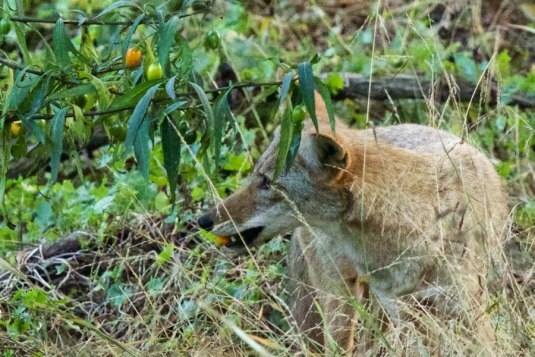 We republish this article from the CoyoteYipps website with permission. 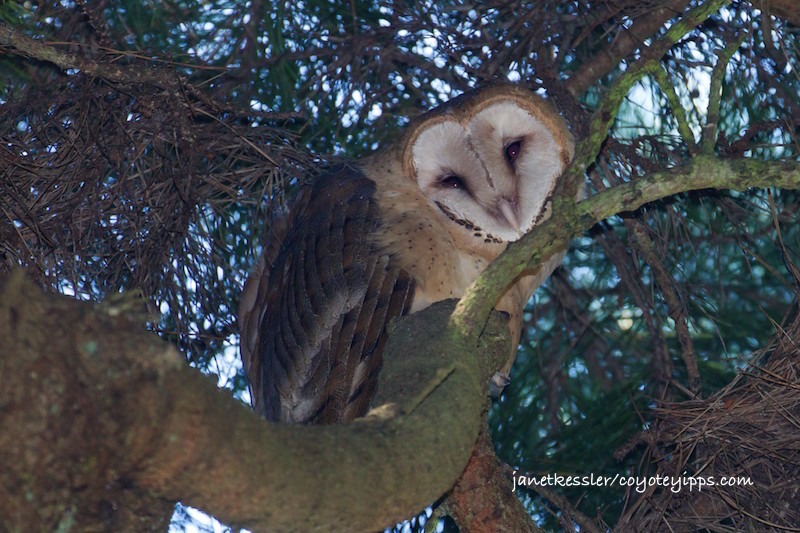 All photographs copyright to wildlife photographer Janet Kessler. Please seek permission before reproducing. 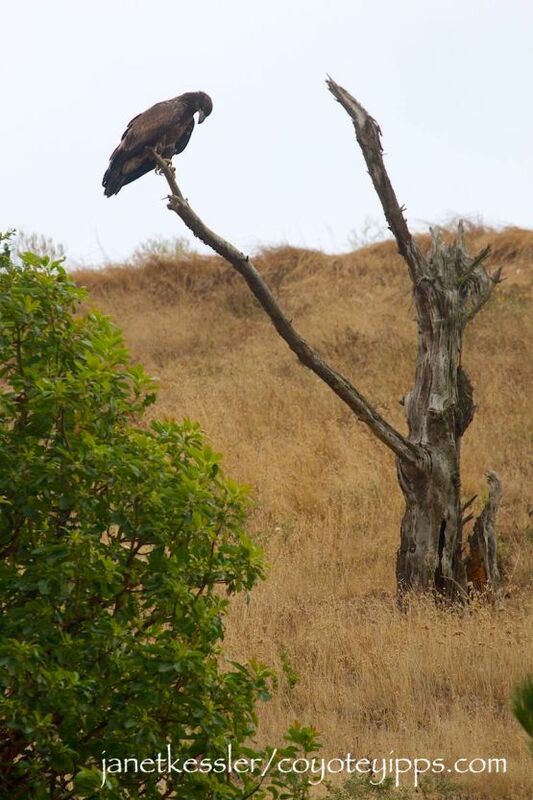 History is Made: A Bald Eagle Lands in San Francisco!! Occasionally I post things not related to coyotes, and this post is one of them. 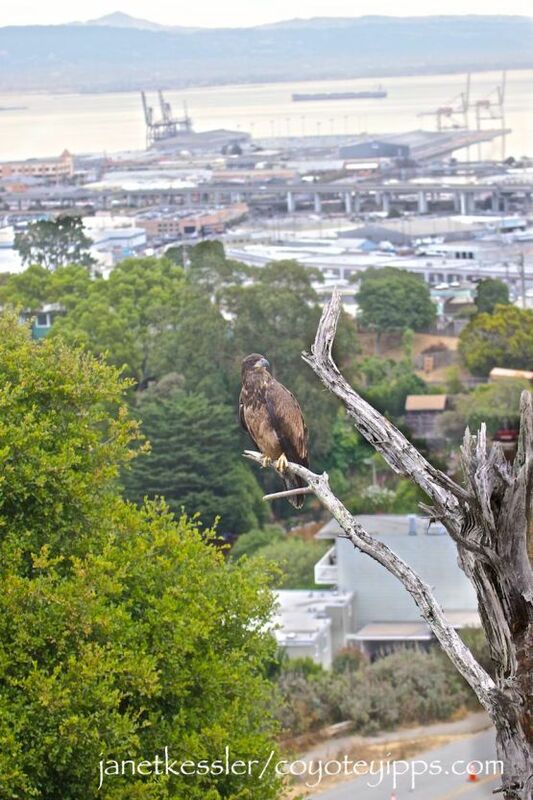 It was Thursday, August 3rd at 8:30 am when I and several friends, including John, Paul, Juan, Anna, Ruth, Debby and Lori watched this huge bird fly in from the north, heading right for Bernal Hill, which is a grassy *island*, so to speak, that rises above, and stands out from, the sprawling city below. We have a number of these *islands* in the city, some of them are grassy and golden, and some are treed and green. Bernal Hill is of the golden variety during the summer months and emerald during the rainy season. After landing on the ground, the bird flew up to a perfect perch — a dead branch. There it remained for two full hours before continuing its flight west and out of sight. During those two hours, the bird looked around, preened, shook itself, scratched itself and pooped! 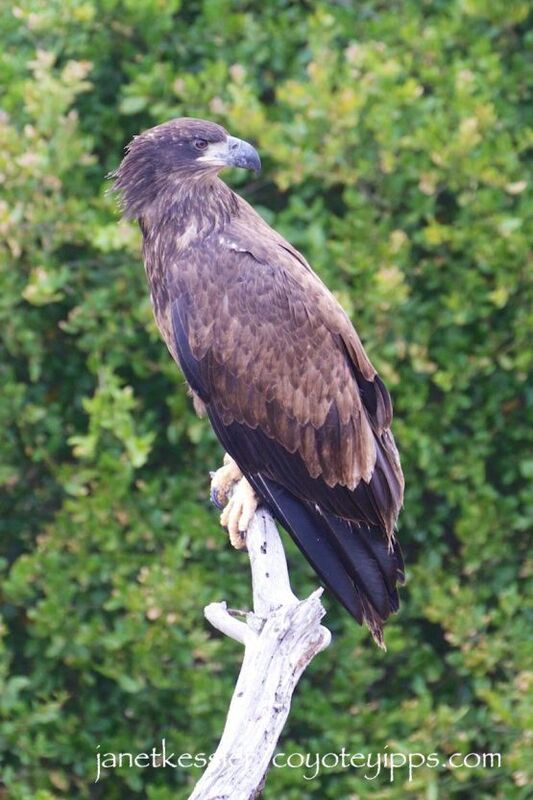 “Bald eagles started nesting close to San Francisco in the last decade (Crystal Springs Watershed to the south, a few years longer up in Marin in the Mt. Tam watershed) and consequently sightings of them flying OVER the city have increased. 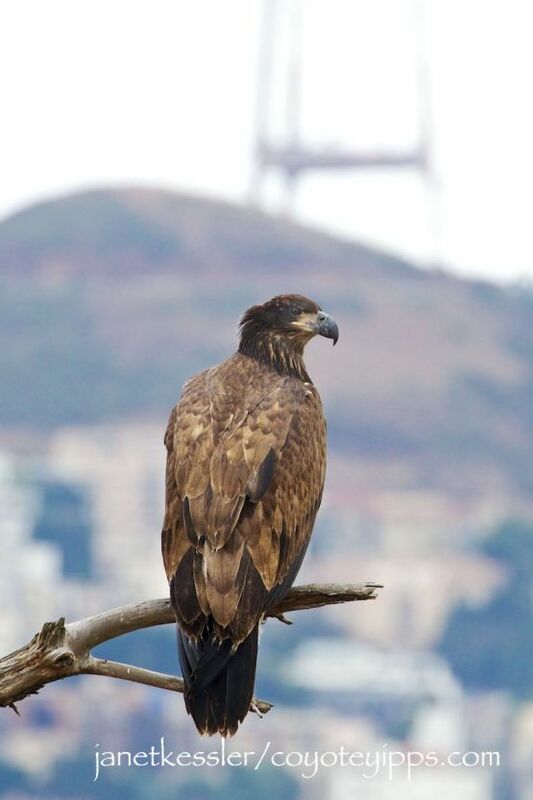 However, as I mentioned, it’s one of just a couple of records of Bald Eagles perching in SF in modern times — probably going back to the pre-Gold Rush days!” Sightings of this bird in San Francisco are indeed extremely rare, which makes this sighting a truly special event. Recently, SFForest was invited to preview a new movie, Seasons. It’s a beautiful depiction of the transition of a forested world to one dominated by humans and their works. We think it would interest those of our readers who love trees and wildlife. It’s reviewed here by naturalist Janet Kessler. This movie, SEASONS, mesmerizes with the beauty and magic of its photography of the forests, forests which are few and far between these days. The story is told almost entirely visually — few words are needed. The movie begins as the Ice Age wanes and melts, creating lush, gorgeous and almost impenetrable forests — life wants to live — and these forests spread across the continents and so do the species which inhabit them. To begin with these are secret places which humans inhabited only minimally — after all, there were few people in the world back then and forests were not so hospitable to people. So the forests were left to thrive — for eons. The movie both gives you a feel for the everyday life of the forest and its inhabitants — the many species that live there — at the same time zeroing-in on these species during both some of their more brutal life-changing transitions and during the softest transitions such as birth. In those few moments of change, the animals become “who”s instead of “it”s — individuals on their journeys through their lives in the forests which covered the world. The movie takes us through a number of seasons. Nothing really changes at first except the seasons themselves. The movie opens onto a white blanket of snow and buffalo coping with incredible cold — each of them in the herd is hunkered down in the snow so as not to expend energy — winter is brutally harsh. We then hear a screech owl as the thaw of winter takes place and hear the dripping of water — the melting snow. And the movie begins. With springtime come babies, birds, bugs . . . too, like bears — and a shy human observer — that’s all the human activity there is to begin with. And we begin to see animals at telling moments in their fight for survival or for a place in their social hierarchies: horses fight viciously for dominance or mating rights — magpies watch knowingly. Soon Fall comes with wind, more bugs and birds, geese migrate and then snow again. And again the snows melt into streams where we see beavers and pelicans. We see hogs and wolves. We see baby ducks jump (literally crash land from enormous heights — but they are light and it doesn’t hurt them) — this is the journey they must take. We see bears, one lying lazily in a tree watching a vicious fight between two other bears — they are amazingly ferocious. We see spiders weaving webs and then more wind and rain, drenching rain this time, and a rainbow. 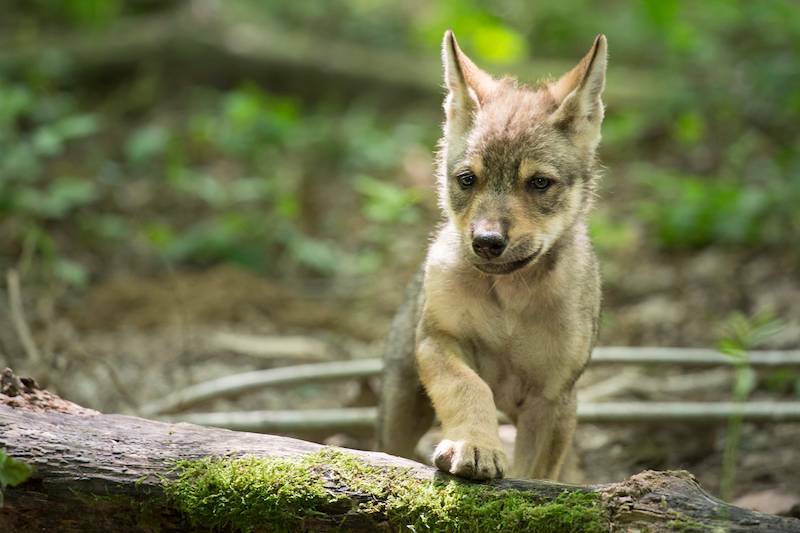 Wolves are introduced: they howl and they hunt and they, too, as bears, moose and horses, have ferocious and life-altering dominance clashes: bears use arms to hit each other, horses use teeth to bite or hooves to kick, deer use antlers to whack each other, wolves use teeth. A snake slithers over low-lying branches and we find ourselves rooting for the little mouse to escape. Flying squirrels are gorgeous — all the animals are gorgeous. Then we see baby wolves escape into their den from a bobcat — how brilliant it is that Mama wolf chose such a tiny entrance to keep such predators away. And throughout it all, green, green leaves which always hide the animals somewhat. The leaves soon turn to oranges and browns and fall off as the seasons progress. A strutting deer is taken by a bobcat behind a snowbank, so we don’t actually see it, but we know what happens. A young wolf is viciously driven out of his pack and has to make it on his own. He accepts his fate — this is HIS journey. And again, we glimpse a single human passing through. Nothing has really changed year after year — only the seasons. But slowly, instead of the wild hogs, we see pigs and goats and castles. There is a hunt and an arrow is used. Humans are taking over with their roads and harnessing animals to make life better for themselves. In the meantime, there are fewer and fewer places for animals to take refuge. Trees are felled — we are told it takes 3,000 trees to build one ship in Her Majesty’s navy. Animals begin taking refuge in the mountains. There are now more open fields, so there are more butterflies. There is another hunt by humans who have “advanced”: they use horses and 20 hounds to pursue one deer. The forests have been cut specifically to allow this kind of hunt: it was a microcosm of what we were doing to the entire world: the world would be for us and us alone. Then machines and horses and war, factories spewing out filthy smoke and the spraying of poisons such as DDT to control our environment. Cities now pop up where forests used to be. The movie proposes that a new alliance is possible — that now we must work to preserve what is left — that it is possible but we must do so now. There still are some forests full of beauty and magic: the movie depicts them in all their gorgeous glory. It’s time to wake up to what human presence is doing and arrest our taking over it all before it is all gone. Experience the beauty of the natural world with SEASONS, a documentary from the team behind WINGED MIGRATION: http://bit.ly/SeasonsFilm. 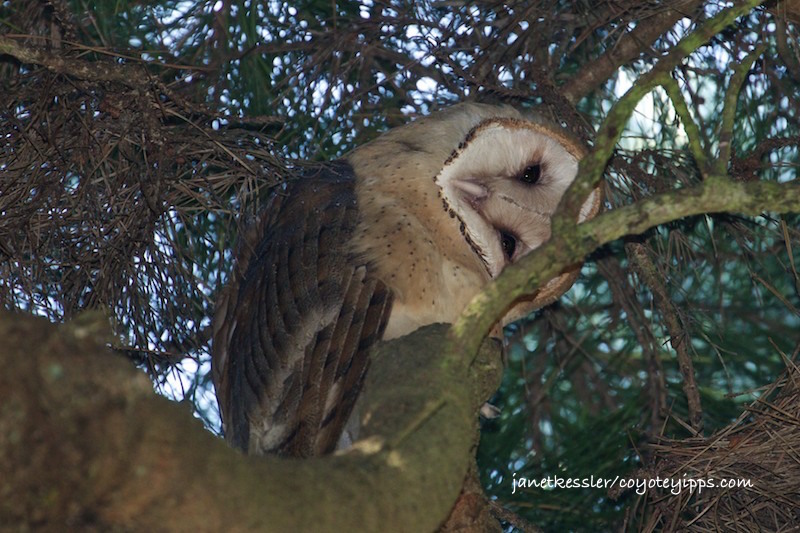 Did you know that Glen Canyon has Barn Owls (Tyto Alba) as well as our famous Great Horned Owls?! Barn owls are much smaller than the cat-sized Great Horned Owls, weighing just over a pound and reaching about a foot in length. Their wingspan reaches over a yard. Compare this to our Great Horned Owls whoooo [misspelling intended] can reach a length of 25 inches, weigh anywhere from two to six pounds, and have a wingspan of 5 feet. Great Horned Owls are considered “true” owls whereas Barn Owls are classed differently as Tytonidae. Barn Owl (Tyto Alba). Their huge eyes don’t move in their sockets like ours do, so an owl must move it’s entire head, rather than just its eyes, to see things clearly. This owl is twisting its head to examine me. Their eyes are no good during the too-bright-light-for-them-during-daylight, so it’s also squinting. Press here for AUDIO: Notice there are a couple of distant coyote barks at the 34-39 second marker, and the owls get really intense at the 2:54 marker. The recording lasts 3:24 minutes. For years I’d seen one at dawn or dusk, gliding and swooping in its silveriness, ever so silently through the dark. You could only see them as you do the bats — against the lighter night sky before total darkness set in in the evening, or before the light of day set in at dawn, or as a shimmer against the darker trees at these twilight hours. 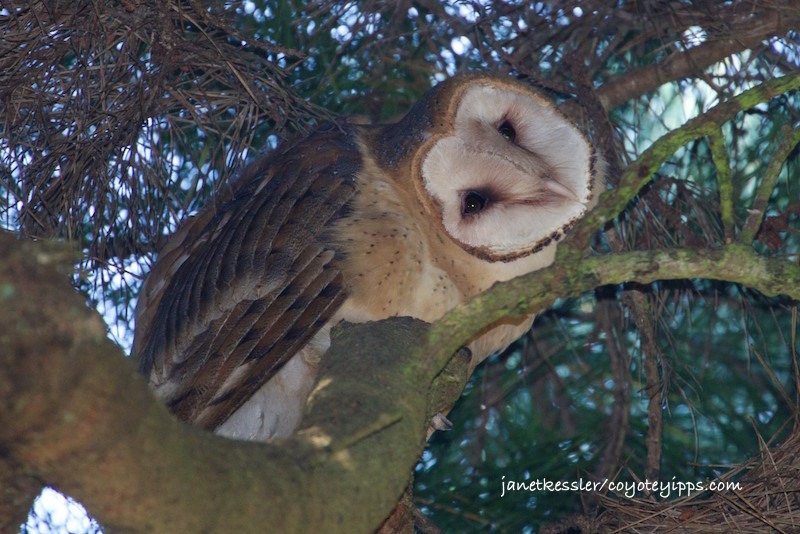 Once, I lay down on the ground and was able to capture, in a photo, one of these owls as it “mothed” right above me, from what seemed like five feet away, examining me out of curiosity — no, it was not courting me! It was because that owl was against the lighter sky that the camera was able to capture its image — it was actually dark outside. They are nocturnal, so if you want to see them you should begin your walk in the dark — and keep your eyes on the sky above the tree-line: you may see one floating silently by before returning to its roost at dawn, or as it begins its “day” hunting at dusk. I’ve Googled some interesting information which I’ve added below. Territoriality. Barn Owls defend the area around their nests, but they don’t defend the area where they hunt from others of their same species — they share. In other words, more than one pair of Barn Owls may hunt on the same fields. Contrast this with the Great Horned Owls who live in the same parks as the Barn Owls but who are very territorial: only one mated Great Horned Owl pair and their offspring live and hunt in any one area. Their territoriality which excludes other Great Horned Owls actually places a limit on the number of breeding pairs in any given area. Great Horned Owls who haven’t been able to establish territories are known as “floaters” — they live along boundaries of established territories. In fact, it may be that just the male Great Horned Owls defend the territories. They are known to kill each other in territorial conflicts, and sometimes resort to cannibalism. Not the Barn Owls! In the summer, the Barn Owls’ home hunting ranges are a little over a square mile; in the winter they can be many times larger. If food is extremely scarce, both of these owl species might move out of their established territories, but there is no annual migration and they maintain their territories for life. Nesting. I found out that most Barn Owls mate for life — they are monogamous, as are Great Horned Owls — though there have been reports that some males have had several female mates at the same time. And Barn Owls tend to use the same nest site year after year. One of their courting displays is hovering in front of the female in a “moth-like fashion” — Oh, I experienced this several years ago! Chicks usually start flying at 9-10 weeks and begin leaving the nest for good at about 11-12 weeks. All will probably be gone by 14 wks. If there is nesting in July, as is the case with this find of mine, it’s usually a second clutch for the mated pair. About 10% of barn owls reproduce two times a year — and some even produce three clutches in a year! 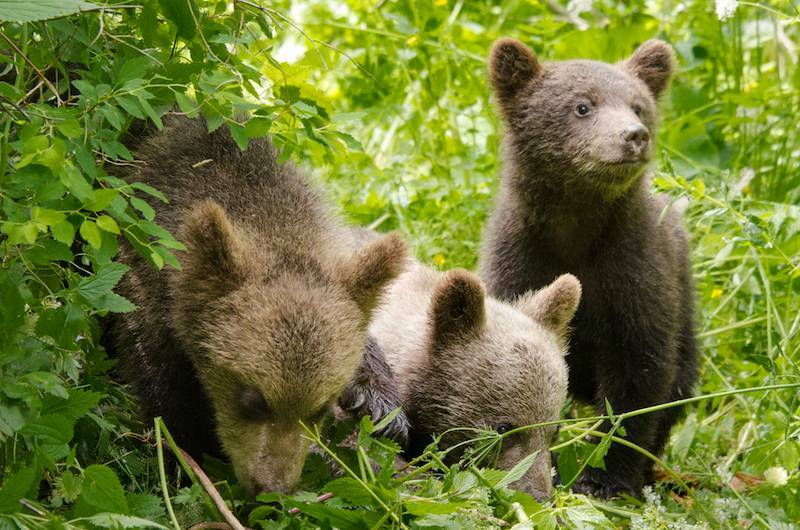 And, although the breeding season is considered from March to August — having expanded due to climate change from an original breeding season which was almost always in May — they, in fact, can produce youngsters at any time of the year. They lay as many as 6 eggs, but more often than not, only about 4 of them hatch. The eggs are laid asynchronously, every 2-3 days and they hatch in the order in which they were laid (sounds like a business telephone answering service, doesn’t it?!). So chicks from the same clutch can actually vary up to about 21 days in their ages. They don’t “build” nests, but find places to lay their eggs which they line with their pellets. Poop. Pellets are actually excrement regurgitated through the mouth. Owls swallow their prey whole, but they don’t digest the bones and fur. The parts of the prey that actually pass through the digestive tract and out of their rumps are excreted as a softish, whitish “guano” — like that of all birds. Guano can often be found dripping down the tree trunks on which they perch. Hunting. All owls’ eyesight is pretty superb — they hunt at night [see “Coyote Night Vision”]. In addition, the ability of Barn Owls to capture prey by sound is the best of any animal that has ever been tested. Their satellite-dish shaped faces helps with this. They eat mostly small mammals such as rats, mice, voles, gophers. Also bats. They don’t eat squirrels so much because they are less active at night. They also eat some song birds. 91% of barn owls, post-mortem, are found to contain rat poison. The most long-lived Barn Owl ever recorded was 15 years old. Poisons. Everyone, please don’t use poisons to eradicate rats, and please ask your neighbors to do the same. Rat poison is a horrible and slow death for rats, causing them to bleed from the inside out, and causing them to become disoriented and slow. This is why owls catch them. But worse, the poison actually travels up the food chain to these owls. Several years ago I sent in two dead barn owls for toxicity tests: they were found to have huge amounts of rat poisons laced throughout their bodies. We’ve also had a number of our Great Horned Owls killed by rat poisoning: One, this year, we guessed, was the mother of owlets who then never made it to adulthood.